So said the signboard I read today, well you can read it yourself as I snapped a photo. I was walking past on a mission with my fiance today, and we had a good laugh. It was one of those days for me, if you didn’t laugh you would have to cry, pain levels quite high for me, an ongoing shoulder problem, anyway moving along here. I am not sure if the retailer was aware of the double entendre of the sign. It may well have been a serious advertisement, before you all run off to Dr Google I have done it already, the signboard is innocent enough, there are no nefarious shenanigans being promoted by this signboard, walk right on nothing to see here. 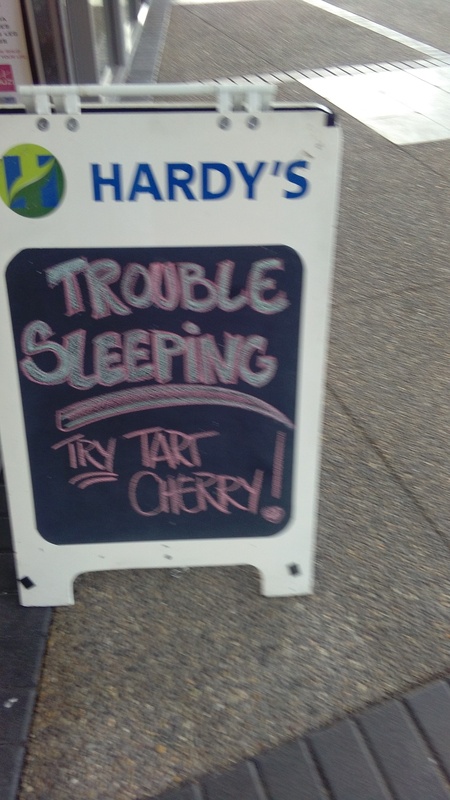 The sign was promoting a sleep aid made from Tart Cherries. There is a huge market for supplements, from maximizing your manhood (it was once an evangelical movement made me laugh then as well) through to minimizing your creaks and groans with deer velvet or chondritin or slippery sea slug slime (ok I made that one up). The list is endless. I have tried the odd supplement or two. I am prepared to give herbal remedies a whirl but I need to see the science as well. I got through a reasonably serious depressive period using St John’s Wort, I could feel its effects pretty quickly and if I didn’t take it I could feel it as well. Just don’ t start me on Rescue Remedy! Homeopathics are just a step too far for me, a hair of the dog remedy that doesn’t even have a detectable hair of the dog, and as for Bach Flower remedies, well I think you might as well howl at the moon, the alcohol carrier that they use is in my opinion an effective medicine. Before I go upsetting good decent earth hugging fockall berry drinking greenies, well actually I don’t mind upsetting anyone who is not prepared to expose their quackery to research. I read tonight about many myths of cold and flu. It is caught by transmission not by walking in the rain, pure and simple, end of arguement, you get it in winter because you are in closer proximity to other people, wash your hands often and you are 50% less likely to catch the flu, now that’s science! Before anyone can accuse me of having a closed mind over the past few weeks I have been having some alternative therapy for my shoulder. My specialist recommended acupuncture so like the good obedient man I am I promptly sought out acupuncture, not from some western practitioner (well do you buy authentic Chinese food from the supermarket or a specialty shop? I have been travelling to a Chinese health provider, they offer a complete service, (minds out of the gutter people) they start with massage then proceed to hickey therapy (also known as cupping) where they place these vessels on various parts of my back and shoulders and create a vacuum to well I am not sure just what it does but they leave marks that my daughter compared to hickeys also known as love bites, pretty damn authentic bruises, the follow this up with acupuncture, flicking needles into various parts of my body, now I know these are doing something because these are very fine pointed needles, not very deep but right into nerve pathways, how do I know this? Well I can feel it, I can stick pins in my body, meh nothing a little sting but when these bad boys go in, whoa then they give them a little turn and yippie ki yay I feel them. Well I haven’t been this week thought I would see if it is making a difference, what I can tell you is that after an hour on the bed with hot towels, a heat lamp some massage and the rest of it I feel better, it does not seem to last a very long time but when I go in at a 9 on the pain level and come out at a 2 and no morphine tablets are being consumed, or alcohol or other herbal remedies than I guess it is a good thing. As I sit and write my pain levels are pretty high, about 8, writing makes it worse, I will take some painkillers and try to sleep, perhaps I should have got hold of Cherry… I am not quite ready for the copper bracelet yet that a helpful man tried to convince me with today, nope back to Little China for me, still not convinced about the cupping though. This entry was posted in Alternative medicine, Laughter is the best medicine and tagged Acupuncture, bach flower, Cherry Tart, cupping, homeopathy, Insomnia, life, rescue remedy, scepticism. Bookmark the permalink.